Among the finalists of our Work Design Now series sponsored by Haworth is the National Democratic Institute designed by RTKL. The National Democratic Institute (NDI) is an international, non-profit organization with 300 employees in Washington, D.C. and 1,000 staff in more than 60 offices worldwide. Their new 57,000-SF facility in DC supports all field operations and serves as home base for professionals across the world. 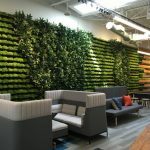 Their move to the space coincided with their 25th anniversary, so it was an opportunity to reinvigorate the organization’s culture and work processes. RTKL worked closely with a cross section of NDI’s employees to discern what makes NDI truly unique. The result is a branded environment composed of glass, front internal offices, and low-panel workstations – an open office that fosters a culture of transparency. RTKL’s design team held multiple visioning sessions with NDI employees and stakeholders to understand their culture and work practices. These exercises helped to create a brand identity for the non-profit organization; one geared toward a high-performance design that expresses a global feel while deliberately maintaining a regional identity. The welcoming atmosphere begins in the reception area and the adjacent conference center. A map wall in the lobby and a vintage globe display in the pre-function area are a nod to the client’s international identity, while ample guest meeting areas and glass walled conference rooms lend a sense of transparency and community. Large-scale brand gestures throughout the space communicate the global outreach and impact of NDI. The client’s highly functional work space features “in-board” private offices with open workstations along the perimeter to maximize natural light and visual connectivity and promote a balance of private and shared workspace. Transparent workstation coves and “huddle rooms” with cutting-edge technology define regional teams and promote collaboration through Skype staff meetings between the client’s local and global teams. Multi-purpose walls double as white boards and pin-up space that speak to the flexibility and innovation of the organization. Additionally, an internal, open staircase establishes a visible connection between their three-floor office space. As a manager, I appreciate having a glass-fronted office that allows me to see and talk more with my team members. The variety of formal and informal conference spaces makes it much easier to convene colleagues. And the board room is much more attractive and functional than our previous space – the space and light are mood-lifters. The built environment transformed NDI’s work methods. Huddle rooms, equipped with the latest technology and embedded within regional teams, enable instant connection with 60+ field offices worldwide. Prime real estate was given to public functions. Pantries, conference rooms and the internal staircase are all along the windows. This egalitarian approach to allotting space underpins NDI’s non-hierarchal culture. A modular and flexible open office layout ensures that NDI can quickly and nimbly adjust to changes in regional teams based on the demand of resources. 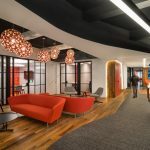 The team’s integrated design approach redefines the way the client works, creating a new culture through an environment that fosters collaboration, provides a welcoming atmosphere, and establishes visual and physical connections amongst the staff.